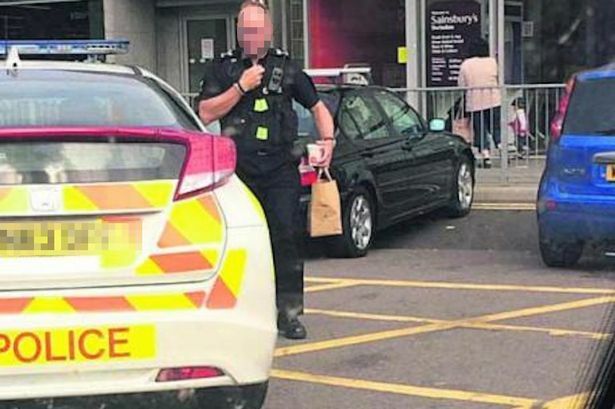 A police officer is being investigated after he blocked a disabled driver by leaving his patrol car in a ‘no parking zone’ as he bought food from a McDonald’s restaurant. Blue badge holder Phillip Skeates, 44, was outraged when the officer pulled in front of him as he waited for one of the spaces to become available. He posted the photograph on Facebook, but embarrassed police had it taken down minutes later. Mr Skeates said: “Being a disabled person, I think this is such a terrible thing to do. “I was so angry because if anyone else had done that they’d certainly have got a ticket. This is an abuse of power. “When he walked back to the car there were lots of people shaking their heads and tutting at the officer. “If he’d have parked there to deal with a crime I obviously wouldn’t have complained, but I think this abuse of power needs highlighting. Mr Skeates saw the hungry officer parked across yellow zigzag lines – blocking another car – and then got out and calmly walked into the eatery in Swindon, WIlts. He initially thought he was answering a call – until he emerged 10 minutes later carrying his lunch in a McDonald’s bag. Mr Skeates said: “I thought perhaps he’d been called to an issue, but I could tell from his body language when he got out of the car that he hadn’t. Mr Skeates was so annoyed he posted the photo of the officer on the Facebook page of the local police. He also complained to Wiltshire Police, who said they were investigating. A spokesman said: “This officer was on a designated break and had stopped off to buy some food. “Clearly, he has not parked his patrol vehicle in the most sensible manner and we can only apologise to other motorists who were hindered by this.